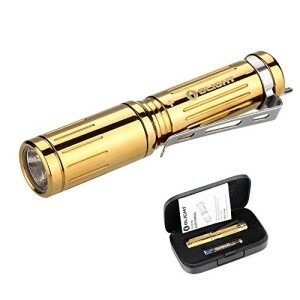 The i3S-CU EOS(I3S-CU) Brass is an all new DEC flashlight ,global total limited 4000Pcs,powered by a single AAA battery. It uses the highest performance Cree XP-L LED and features 3 brightness levels. Its maximum output reaches to 180 lumens and the runtime is over than 96 hours at low setting. The i3S-CU is made by brass alloy featuring high heat conductivity and low electrical resistivity which feel very comfortable. With adoppting the latest PVD technology to the i3S-CU,the high bright edition i3S-CU has a elegant appearance with anti-scratch titanium gold coating. The light is durable and will still retain shiny gold for long term application. To show the best natural color which brass ally have, the original edition does not do any finshed to keep its strong texture. The i3S-CU is a great choice for an every-day-carry light as well as a premium gift for someone special.